All I really wanted to do on Sunday was sleep. But the life of a six year old boy's dad is not that restful. I was hoping that Peyton had forgotten all about wanting to run the Bridge. I was thinking that the cold weather would make him want to just stay inside. No such luck. 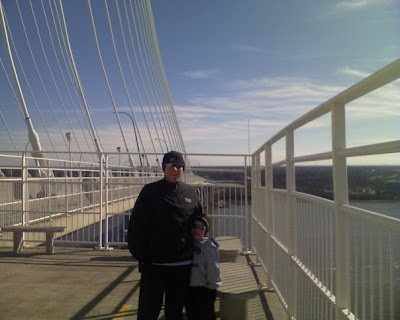 At 10:00am we were bundled up and heading out the door for a run over the Cooper River Bridge. Now, you may be asking yourself why would a six year old even care about running over the Bridge on a Sunday morning. First, he is as crazy as his dad! Second, he has a running goal (a big one). He tracks his running on a chart that has squares on it and every time he runs half a mile he gets to color in half of the square. When he is finished with all of his squares he will have completed 26.2 miles (his own marathon!). He actually wrote at school that his New Year's Resolution was to run one mile every week (he has not broken that resolution yet). The Bridge is one mile up and one mile down. The wind was really blowing hard and it was cold! He ran about half way up without stopping (I was very impressed). He saw a group of tourist ahead of us and wanted to beat them to the top so he walked for a little while and ran the rest of the way to the top (13 minutes!). We hung out on the top and looked out on the Charleston Harbor, the Yorktown aircraft carrier and Fort Sumter. It really is beautiful. The group of tourist showed up and I got them to take a picture of us with my cell phone. We headed back down -Peyton ran about half way, walked a few seconds and then ran the rest of the way (9 minute mile!!!). That was crazy! He was so excited. We went home and hung out until Cub Scout time and went over to Fort Moultrie on Sullivan's Island. He wanted me to point out all the "rivers" I ran through the day before (he laughed a lot). Hi, ur blog is really nice and interesting, i truly like & enjoy it. I just wanna suggest that u should go for blog advertising & marketing there is a website which is offering very unique features at affordable prices. There are Expert advertising teams who will promote ur blog & affiliate ads through all over the networks. All u have to do is submit your blog plus pay affordable prices and rest leave it to Advertising Team for Promotion & Marketing then see how u enjoy a lots of quality traffic plus more readers to ur blog. Finally I have bookmarked ur blog & also shared with my friends hope u have a wonderful day & ! !happy blogging! !.